Judge Jones is a never-ceasing voice for young people throughout their educational journeys. 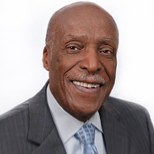 Honoring a life dedicated to civil rights and activism, the NAACP named the Honorable Judge Nathaniel Jones as recipient of this year’s Springarn Medal, the organization’s top honor. KnowledgeWorks offers sincere congratulations to Jones, who has been a member of the organization’s board of directors in 2002. Jones, who is known for his fight for civil rights throughout the U.S. and South Africa, is well deserving of this recognition. He served in the United States Air Force in World War II, received his A.B. and L.L.B. (converted to J.D. ), and practiced private law before then-Attorney General Robert Kennedy appointed him as Assistant United States Attorney for the Northern District of Ohio in Cleveland. From there, he was appointed to serve as Assistant General Counsel to President Johnson’s National Advisory Commission on Civil Disorders, also known as the Kerner Commission. In 1969, Jones became the NAACP general counsel. For the next nine years, he directed all NAACP litigation, which allowed him to personally argue several cases in front of the U.S. Supreme Court. In 1979, President Jimmy Carter nominated Jones to the U.S. Court of Appeals for the Sixth Circuit. He served on the court for 23 years. He also coordinated national efforts to end northern school segregation, defend affirmative action and inquire into discrimination against black servicemen in the military. Other Springarn Medal recipients include W.E.B. DeBois, George Washington Carver, Jackie Robinson, Edward Kennedy (Duke) Ellington, Rosa Parks and Martin Luther King, Jr.